As a quality driven enterprise, we are engaged in providing Solar Water Heater. The systems are comprised of an independent primary circuit; therefore, antifreeze can be added in order to prevent problems due to risk of freezing or water hardness Corrosion. Being one of the trusted firms in the industry, we are highly engaged in providing a unique range of ETC Type Solar Water Heater. PUF Insulation: 50mm Round & 100MM covering Side Dish. 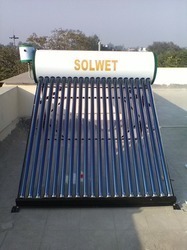 As a quality driven enterprise, we are engaged in providing ETC Solar Water Heater. Looking for Solar Water Heater ?